What’s better than fooling your friends into eating vegetarian food than making a pot full of meatless sausage balls, omitting the fact there’s no meat, watching them eat one after the other and listening to them asking for the recipe?… (Insert ticking clock sound effect)...I can’t think of much that’s better than that! Well, other than wine. And chocolate. And designer purses. These are relatively easy to make; they require a couple of steps and some preparation, but it’s not rocket surgery. LightLife makes a great sausage style veggie meat that tastes great, but is further enhanced by adding a blend of spices used for “real” sausage. Sage and fennel, anyone? Don’t mind if I do. This appetizer dish can be made as mild as you wish, or as spicy as you wish. Of course we opt for super hot and spicy. 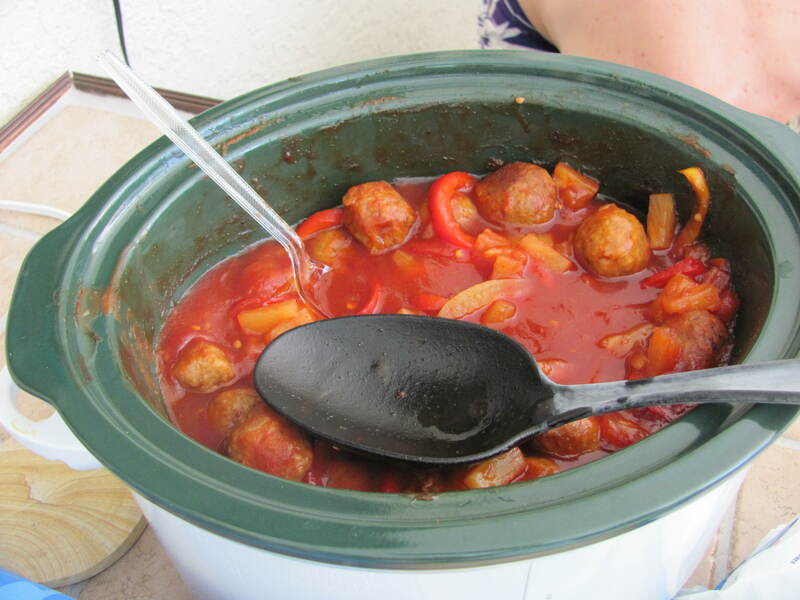 The sausage balls and sauce are actually just made on the stove top and placed in the crock pot to keep warm. However, letting the sausage balls bask in the sweet, sour and spicy glory for an hour or so makes them taste even better. Mix all spices together in a small bowl – this is your spice rub for the sausage. I took 1 tbsp of olive oil into another small container and kept dipping my fingertips in it to help the veggie meat from sticking to me. I opened up one package at a time and kneaded about half the spice rub into the first package and then the rest into the second package. Form the Gimme Lean sausage into balls about one inch in diameter. Heat the remaining 3 tbsp olive oil in a large skillet. Brown sausage balls very well on all sides and set aside on paper towels to drain. Heat oil in medium skillet. Add peppers and onions and sautee on medium heat until soft. Add remaining ingredients, stir to mix well and simmer about 10 minutes on medium high heat. Reduce heat to medium low and simmer about 10 more minutes. Place sauce (including the onions, peppers and pineapples) and sausage balls into the crock pot and put it on the low heat setting. If you have time, let them sit for about an hour to marinate in the sauce. Serve and enjoy! Sounds interesting. I have never heard of the veggie meat you refer to. Will have to keep an eye out for it and maybe try it out. As a meat eater, I think this would be good with ground turkey or ground chicken as the base too. Hi there! You can check out LightLife’s website at http://www.lightlife.com. I am not sure of your location, but I am in Tampa, Florida. LightLife products can be found at health food grocers like Whole Foods, but I buy mine at a local chain of grocery stores called Sweetbay Supermarket. Publix Supermarket here in the Southeast carries their products too.